Autologous platelet gel (APG) was developed in the early 1990’s as a byproduct of multicomponent pheresis. When platelet concentrate is combined with thrombin and calcium, a viscous coagulum (gel) is rapidly formed. Initial successes lead to expanded applications where large blood losses were not typically encountered. Tensile strength and adhesive ability adequate due to platelet/fibrin interaction. Native concentrations of fibrinogen lead to effective fibrinolysis and resorption of the platelet gel. Platelet secretory granules contain: PDGF, TGF-ï¿½, PDAF, PAF as well as all other naturally occurring proteins intended for tissue repair and regeneration. Since 1982, several studies have shown enhancement of in vitro tissue cultures are enhanced by addition of platelets. Platelet derived wound healing factor (PDWHF), an extract of activated platelets, has been shown to enhance healing of cutaneous ulcers. Platelet derived growth factor as a isolated cytokine has been shown to enhance wound healing in several animal models and non healing wounds in humans. 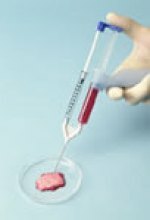 Autologous platelet gel contains supraphysiologic amounts of platelet derived growth factors (50-60 ng/mL) in a sustained medium at the site of wound healing. Benefits of multiple growth factors acting synergistically. Growing body of evidence supporting improved outcomes.